In Hama, Syria a member of the Al-Farouq Brigade shows off a rocket manufactured with an unexploded cluster bomb. In addition to being the only country in the world to have reportedly deployed landmines in 2012, the Syrian government has also been using cluster munitions on rebels and civilian populations in its brutal effort to end the civil war there. The use of cluster bombs has not only earned global condemnation, but has inadvertently served to help arm the rebels. Cluster munitions have a very high failure rate. Areas that have been target by cluster munitions often remain dangerous for decades to come. 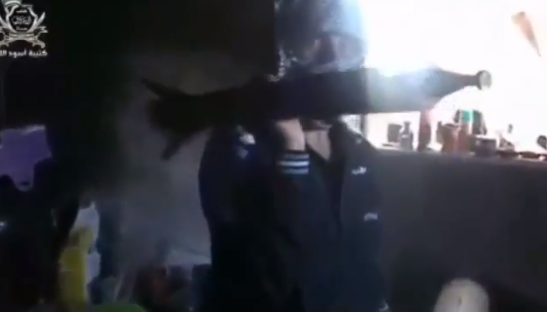 The video below (found via the excellent Brown Moses blog) shows how Syrian rebels are (very dangerously) harvesting unexploded cluster “bomblets”, defuzing them and using them to manufacture rockets. At the start of the video we see the bomblets being plucked from the ground, itself extremely dangerous, and the fuze being removed. We then see the rocket workshop with rows of these bomblets on the ground, all with the fuzes removed, and we’re then shown a bomblet having it’s tail fins removed, and replaced with a fitting that then allows it to be screwed into the rocket. A newly manufactured fuze is screwed into the bomlet/warhead, completing the rocket. While the above use of cluster bombs as rockets is a novel approach, recycling unexploded ordnance for use against the forces that originally dropped or fired them is not a new idea. A large number of improvised explosive devices used against US forces in Iraq and Afghanistan use explosives harvested from US ordnance that never detonated. The video below shows how the North Vietnamese repurposed unexploded US ordnance to manufacture landmines for use against the US military resulting in, as the video claims, 10% of US casualties in the Vietnam War.